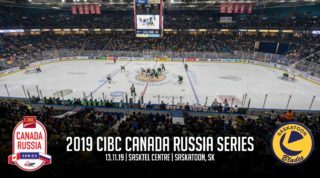 The Saskatoon Blades were back on the ice on Friday night in Prince Albert, but couldn’t get back into the win column against the Raiders. Saskatoon dropped the game by a count of 5-2, kicking off their annual post-holiday home-and-home at the Art Hauser Centre. The Blades and Raiders kicked off their annual post-holiday home and home on Friday night with a scoreless but physical first period. The Raiders had the first good chance of the game only 5:30 in as Gage Quinney fed Reid Gardiner, who got a chance away but was stymied by the left pad of Blades starter Troy Trombley. The Blades then answered with their own good chance later in the period while on their first PP of the game as a Cory Millette slap shot left a puck beside the net for Matt Revel who just ripped the chance wide of Raiders goalie Cole Cheveldave. The top chance of the period for either team went to Saskatoon with two minutes to play in the frame. Import forward and leading scorer Nikita Scherbak walked through a pair of defenders at the opposing blueline, kicked the puck up to his stick and deked to the forehand, only to have his chance denied by the pad of Cheveldave to keep the game scoreless. Shots were 16-6 for Prince Albert in the scoreless frame. The second period didn’t start out the way the Blades would have liked as only 1:55 in the Raiders got on the board. The opening goal of the game came after a Shane Danyluk wraparound and rebound, which Reid Gardiner cashed in for his 15th of the season. The Blades had a chance to answer under a minute later during a 3 on 2 rush, with a Ryan Graham wrister from the off-wing being stopped by Cheveldave. The Raiders then struck for a pair of bang-bang goals at 7:10 and 8:23. First it was Gardiner getting his second of the night after a give and go with Gage Quinney, scoring on the PP. Then it was Darcy Zaharichuk scoring his 5th of the year on the wraparound, beating Trombley as he was left scrambling in his crease following a frantic Raiders flurry. Then the physical play picked up. 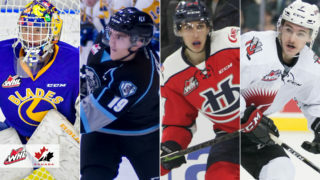 Clayton Kirichenko and MacKenzie Dwyer both had huge hits in the Blades defensive zone, with Dwyer also generating a good chance off a point shot in the frame while making his WHL debut. The Blades then got on the board at the 15 minute mark. The goal came off a mad scramble in the Prince Albert zone, with a loose puck ending up on the tape of Ayrton Nikkel. It wasn’t on his tape long as the defenceman unleashed a hard slap shot from the slot, beating Cheveldave to make it 3-1 with his 2nd of the season. With an assist on the goal, recently-recalled forward Haydn Hopkins registered his first career point in his first career WHL game. That was all the scoring in the frame as it was a 3-1 Raiders lead through 40 minutes, with the shots sitting at 29-16 Prince Albert. The Blades came out with the first good chance of the third period as 1:25-in Ryan Graham made a nice power forward move by walking out of the left-wing corner and firing a high shot on the Raiders net. But Cheveldave was up against his post, square to the shooter and made the glove save to keep it 3-1. 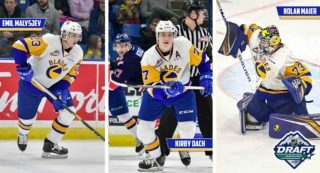 The next goal was going to be huge in the game and it was the Raiders who got it on Friday night as Quinney made a nice move beside the net and centered it with Shane Danyluk finding the loose biscuit and burying it to make it 4-1 with 6:58 gone in the period. The Blades almost got back within two goals with 11:31 to play in the stanza when Graham used his speed to get to a loose puck on the rush, but his one-handed attempted was kicked out by Cheveldave to preserve the 3-goal lead. But that lead would eventually shrink as at 11:21 Nathan Burns would win a race to a loose puck, feed Scherbak, who then got the puck to Chase Clayton, who chipped the puck past Cheveldave from in front to make it 4-2. The goal gave Saskatoon life as the next shift they generate a pair of chances, with the Raiders goalie then having the answer. With 5:06 a long hard shot by Brett Stovin was also turned aside as the 4-2 goal clearly gave the Blades some life. The Blades came close in the final minute as a loose puck was batted home with Troy Trombley on the Blades bench for an extra, but the play was whistled down with the ref saying it was knocked in with a glove. Then, the game was iced as Jayden Hart hit the empty net with 36 seconds to play, making the final 5-2. You can find the full box score from tonight’s game between the Blades and Raiders right here. 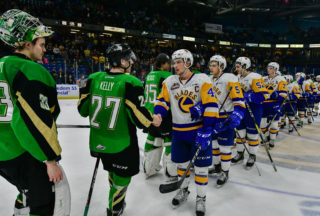 These two teams close out the home and home on Saturday night back in Saskatoon. You can go ahead and find your tickets for the game right here. 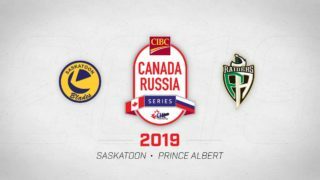 The Blades also have Ukrainian Night approaching, with the 101st Grey Cup Champion Saskatchewan Roughriders also appearing at the game for autographs and a special ceremony. Read more about that big night and find ticket links by clicking on this story.